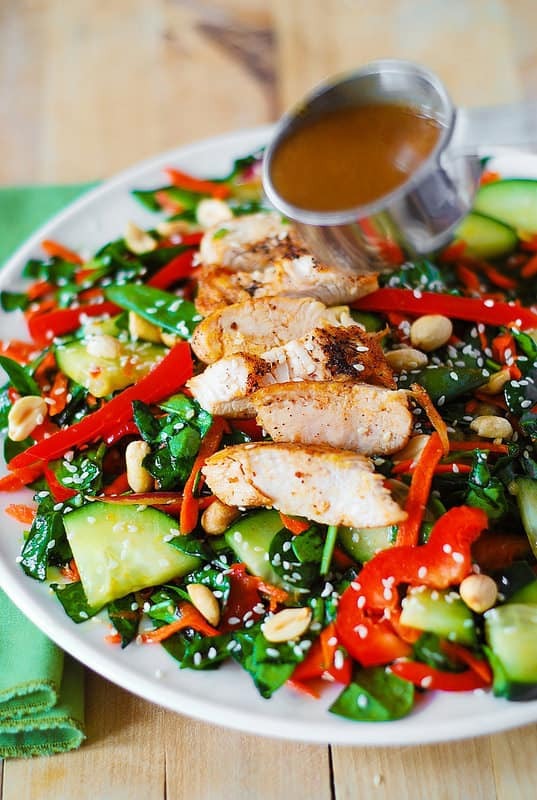 Crunchy Asian Salad with Veggies, Chicken and homemade Sesame Peanut Dressing – gluten free recipe, full of fiber, protein and nutrients! 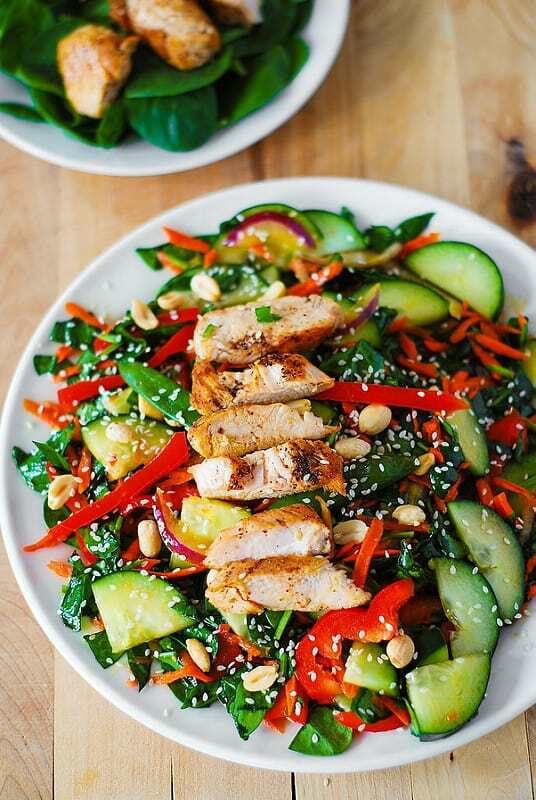 Lots of vegetables: spinach, cucumbers, red bell pepper, carrots, sugar snap peas – all tossed in a delicious, homemade peanut dressing, and topped with grilled chicken, roasted peanuts and sesame seeds. The salad dressing is out-of-this-world delicious, with a distinctive Asian-style flavor to it. It’s sweet and sour, and very creamy! Just like in this Asian Noodle Salad with Peanut Dressing. I just love-love making Asian food at home because in this case I know exactly what I put in my food, and it always tastes so good! 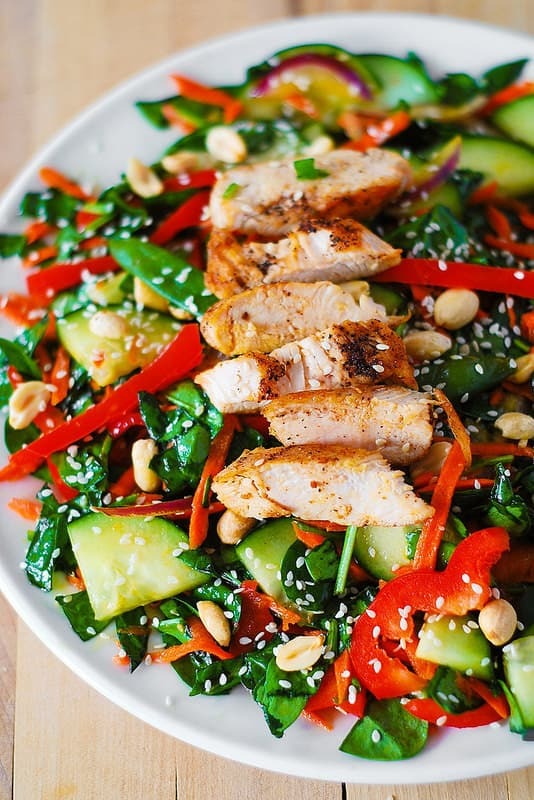 This crunchy Asian salad with veggies and chicken makes a great dinner. 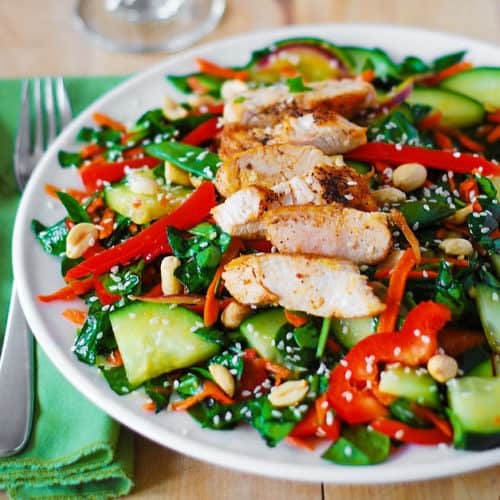 Crunchy Asian Salad with Veggies, Chicken and homemade Sesame Peanut Dressing with roasted peanuts and sesame seeds. Spinach, cucumbers, red bell pepper, carrots, sugar snap peas – all tossed in a delicious, homemade peanut dressing. In a medium bowl, combine and whisk together all dressing ingredients, except for 1 tablespoon of sesame seeds. Bring a pot of water to a boil, add the sugar snap peas, and cook for about 5 minutes, until peas are crisp tender. Drain, rinse under very cold water (to stop cooking), drain again and set aside. Combine all salad ingredients in a large bowl. Pour the dressing over the salad, just enough to coat (you don't have to use all of the dressing, unless you want to). Sprinkle the salad with the remaining tablespoon of toasted sesame seeds. Serve the salad in the individual serving bowls and top with the sliced chicken. We had this tonight and it was so delicious! We came home from a trip today and didn’t have time to grill chicken, and it was great with rotisserie chicken! We will try it next time with grilled chicken! Just perfect! Thank you!